I hope you had a beautiful weekend! I spent some time up north visiting my parents for Mama's Day and got in a joyous dose of nature. I want you to know how beneficial nature is for your health. In fact, I wrote about this in my book as well and I talk about this in every workshop I teach. It's quite intuitive when you think about it -- nature being good for us that is! Nature triggers feel good chemicals in the brain. Learn more about the health benefits of nature in my video. Being in nature, especially near a waterfall lake, river or seaside is a great place to get exposed to negative ions. These ions actually have a positive effect on the body. The bad guys are the positive ions which are abundant in our daily lives. How does this happen? We are constantly exposed to cell phones, televisions, computers and modern technology which all provide positive ions. They can promote depression, irritability and poor health. Negative ions on the other hand promote biochemical reactions that increase levels of the mood chemical serotonin, helping to alleviate depression, relieve stress, and boost our daytime energy! 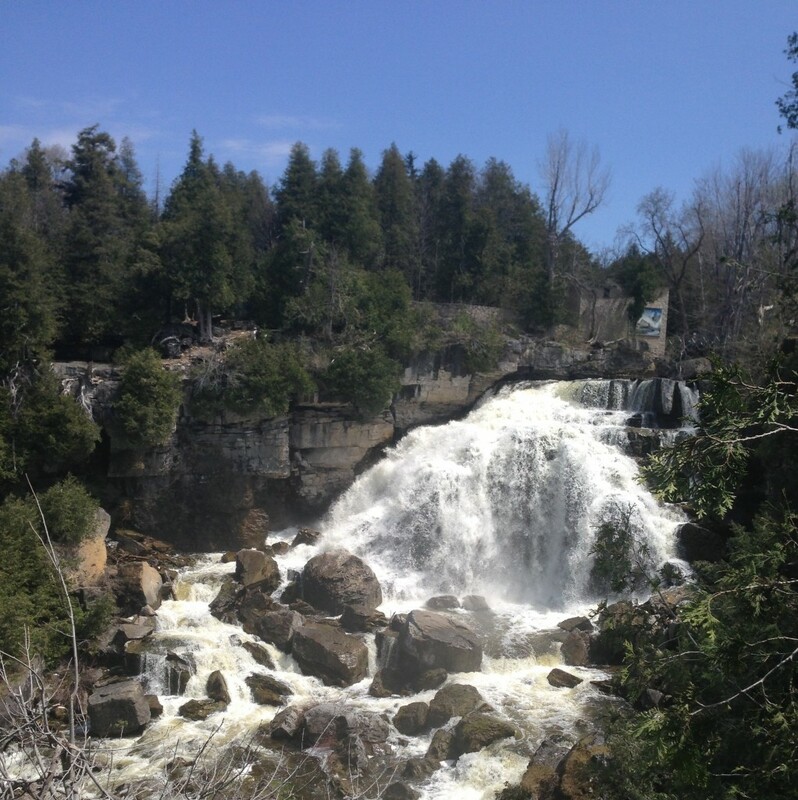 The gorgeous photo below (and the tree hugging one above) was taken on my iphone at Inglis Falls, Owen Sound. I felt the positive effects of those negative ions! Need some inspiration and motivation to get your daily dose of nature? Join me in the David Suzuki 30x30 Challenge! Or get yourself a Himalayan Rock Salt Lamp. They sell them at most health food stores. Watch my waterfall video on the Joyous Health facebook page. Learn more about the health benefit of nature in my book JOYOUS HEALTH, chapter 5! Hi Joy! This is neat timing...I just discovered "grounding", which happens when you go barefoot and walk on grass (which I remember in a previous post you saying that is one of the first things you do when you visit your parents) ...it's calming because apparently it 'syncs' your nervous system to the same frequency as the earth's frequency, thus calming the whole nervous system - SO cool - free stress relief :) There are some really awesome videos about it on YouTube, and also some sandals you can buy that ground you while you walk. Anyways, sorry for the long comment, I just thought it goes along with this post, and wanted to share with other readers. Enjoy your weekend everyone! WoW! Very nice post and really very happy to know about positive and negative ions. And ya, I like your pic hugging a tree. Thanks again.